The provisioning of the piece of the equipment was made possible under the United Statesâ Presidentâs Emergency Plan for AIDS Relief (PEPFAR), which was started in 2003, by then US President George W Bush. 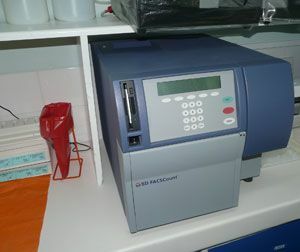 The machine is used to monitor the CD4 count in persons infected by HIV, helps determine the stage of the infection, and guides the drug choices and shows patientâs response to treatment and disease progression. Last Thursdayâs commissioning means that the laboratory at the MCMH now has two such pieces of equipment, this according to Claudette Laidlow-Williams, the Chief Laboratory Technologist. But the service that the older machine provided was plagued with periodic interruptions, as the machine would break down, Williams said. âThis new machine will go a long way in alleviating the previous situation, as we donât expect that both machines will be down at any one time,â she explained. The Chief Lab Technologist further contended that she looked forward to the continued partnership under the PEPFAR program. Dr Brent Hardt, Charge dâAffaires of the US Embassy in Bridgetown, Barbados, said that the programme was initiated to assist with the worldwide problem of HIV/AIDS. According to Hardt, a decision was made to strengthen the capacity of laboratories throughout the region. âWe are pleased to be able to donate the machine, as it will build capacity to monitor persons living with the disease,â Hardt said. He added that the piece of equipment will assist in identifying critical bits of information as it pertains to the disease, such as what target groups are most affected. Minister of Health Cecil McKie said that despite the numerous challenges, the provision of the piece of equipment will go a long way in building capacity in the management of the disease. âGone are the days when persons affected with HIV/AIDS were written off, but now with equipment, (we) can ensure persons maintain a healthy lifestyle,â the Minister of Health said. He also said that it was the intention to improve on all sectors of health in the country.